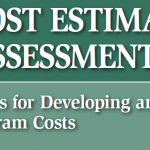 I found a few great resources, and one of them was the US GAO Cost Estimating and Assessment Guide.? It contains a wealth of knowledge and guidelines for major government projects, and also a lot of lessons that non-government and small projects can use. Here is a link to the guide, and a video below where I introduce it for you.